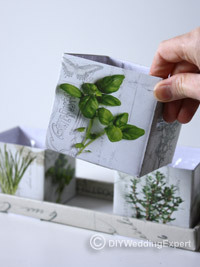 I’ve just found this pretty set of herb themed boxes that I thought I could make into some great wedding centerpieces. Here you can find my very simple step by step diy centerpiece project which shows you how to create your own herb table wedding decorations. It would make a perfect wedding centerpiece for an outdoor wedding or a wedding with a green wedding theme. 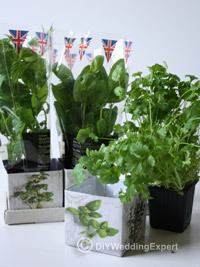 I can just see these herb centerpieces running down the middle of long wooden tables set in a garden or marquee. 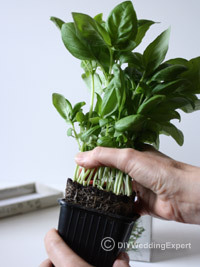 It’s also perfect for a green wedding as the guests can take the herb plants home at the end of the evening to eat or plant in their own gardens. A set of boxes, you could make your own, decorating them with pretty paper to match your wedding theme. I’ve also seen herb plants placed in decorative food cans, baskets and small garden troughs, which all make great wedding centerpieces. Herb plants. I simply bought mine from a local supermarket. But you could even grow your own from seed if you are organised enough. 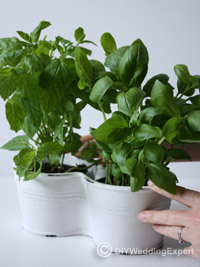 Simply remove the packaging and plants pot. 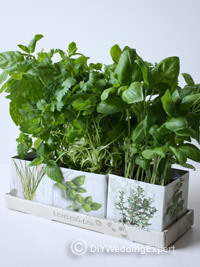 Plant into your boxes or containers using more soil if needed. Give them a water to allow them to settle. My cardboard boxes had a plastic lining so that the cardboard doesn’t go soggy. 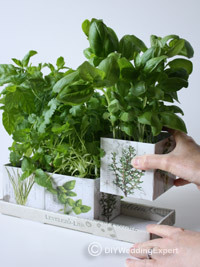 I like the way this set of boxes had a cardboard tray to hold all three plants into place, I’m sure you could find similar things in places like Ikea or your local garden store. I’ve seen similar designs made out of enamel metal that people use on their kitchen windowsills. You can choose containers that fit with your wedding color theme. Here you can see an alternative pot, it’s two plant pots that are joined together, which makes a great wedding centerpiece design. Why not add decorative butterflies or bees that look like they are hovering over your plants. 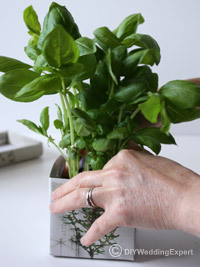 You’ll get a lovely fragranceon your reception tables from theses pretty herb wedding centerpieces. Find more ideas for do it yourself wedding centerpiece projects.